Video clip synopsis – John Safran talks about the unique techniques, structure and ideas of reality TV. Broadband MP4 formats_bb.mp4 (5.9MB), suitable for iPods and computer downloads. 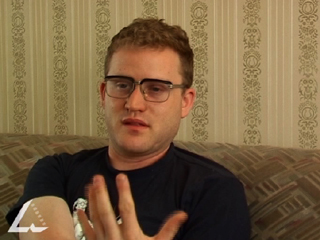 This interview with John Safran was recorded for the website From Wireless to Web produced in 2005. The rise of home video technology was behind the ratings success of a new kind of program, Australia’s Funniest Home Video Show, launched on Nine in 1990. The show combined viewers’ video clips with sound effects and comedic voiceovers. However it was not without its predecessors, such as Candid Camera. These technologies have also reduced the cost of professional news gathering and led to increased sourcing of footage from the public, most famously in the 1992 Rodney King case in Los Angeles. The 1990s were the start of the low-cost 'reality TV’ phenomenon that dissolved the boundaries between games shows and documentaries. Reality TV productions involve using 'ordinary people’, and in doing so the medium of television comes to play a direct role in contestants’ lives. Cheap and portable cameras were also behind the success of the ABC’s 1997 Race Around the World. The program followed a group of young filmmakers who were funded to travel the world and record 10 four-minute documentaries using camcorders. Race Around the World introduced the viewing public to John Safran, who infamously demonstrated his techniques for breaking into Disneyland and streaking through the streets of Jerusalem. SBS was also experimenting with production technologies and drama and comedy formats in its 1999 program Going Home. The show was based on the interactions of evening commuters on Sydney’s rail network, and their commentaries on the events of their day. What do you the impact of the new technology has been on television? Look at both the news/documentary field and the entertainment field. What moral and ethical implications might there be with this technology? How do you think it has shaped the way shows are made? Do you agree with John Safran about how it compares to film? Do you think ‘reality television’ is really capturing reality? Do you believe that people behave the same when they are in front of a camera? Is there a selection process that happens in production and post-production? Is it possible to ever really capture reality? How or why not?